Ever flip around a bottle of shampoo to read the ingredients? Usually it's just a jumble of words I can't even begin to imagine how to pronounce. Sometimes these hard to pronounce words are just the botanical name for something plant-based or the scientific name for something otherwise totally natural and safe. Oftentimes these weird words are the names of some dangerous chemicals. Synthetic chemicals and some natural metals linked to cancers, reproductive illness, developmental difficulties, and other serious health issues are ingredients featured in the personal care and cosmetics products that line the shelves of drug stores, upscale department stores, and boutiques alike. Hopefully, use of harmful chemicals in personal care and other household products will eventually be more regulated. Meanwhile, it's a good idea to check and see if the products you and your loved ones use are safe. I know it's overwhelming, especially because we live in a time when everything seems to give you cancer. Still, it's so important to be aware and do your best to avoid synthetic chemicals when possible. 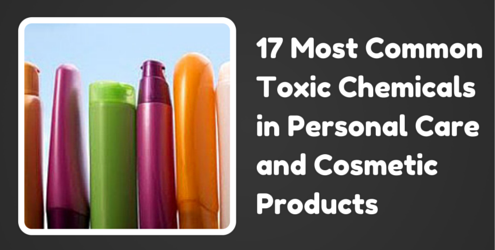 Here's a list of 17 toxic chemicals to avoid in your personal care products. Making natural lip balm is easy, economical, and fun! Here's a basic lip balm recipe (with a beeswax-free vegan adaptation) along with helpful tips for beginners and info on where to buy tubes and other supplies online. This recipe makes 9-10 tubes of lip balm. I've included info about how many parts of each ingredient to use so that you can easily halve or double the recipe. Oatmeal doesn't have to be boring! It doesn't have to be loaded with sugar or butter to make it palatable either. Start with hearty steel cut oats (or gluten-free steel cut oats). They're firm and have a nice mouth feel. Because they are less processed, steel cut oats have a lower glycemic index than rolled oats. This means they take longer for your body to break down-- keeping you fuller longer-- and causing a slighter sugar spike than rolled oats, leading to less chance that you'll be reaching for a snack before lunch. Both old fashioned rolled oat and steel cut oats are leaps and bounds better for you than instant oatmeal. And don't even get me started on that sugary crap in the paper packets. Yuck! You don't need that. You can make truly fancy oatmeal yourself with real nutrient dense ingredients. Warming spices like cardamom, cinnamon, ginger, clove, and nutmeg are perfect for a cold season breakfast. Sprinkle some in your oatmeal. These spices curb sugar cravings because they are sweet and because they enhance the sweetness of the natural sugars present in foods. I find sprinkling a little sea salt on my cereal helps to bring out the sweetness of whatever sweet things are in there too. Do you like chocolate? How about adding some cocoa powder (baking kind, not hot chocolate mix) or raw cacao for sugar-free chocolately goodness? Or how about stirring a few semi-sweet chocolate chips to your bowl of warm oatmeal? Yeah!